Does FATCA stop tax evasion? – Let's Fix the Australia/US Tax Treaty! Does FATCA stop tax evasion? So, is FATCA responsible for stopping tax evasion? On twitter yesterday someone (not worth naming, he has no followers) claimed that FATCA was the root cause for the enforcement action announced by Kelly O’Dwyer, Minister for Financial Services last week . This was also reported by Bloomberg . The headline number in the press release was A$900 million of transactions – these transactions are not necessarily unreported income, and even the part that is unreported income will be taxed at a rate less than 100%. In fact, of 578 taxpayers listed in the original investigation, the vast majority were found to be compliant and only 106 are the subject of the ongoing enforcement action. The claim in yesterday’s tweet was that FATCA broke Swiss banking secrecy and was therefore responsible for this potential tax revenue. However, Swiss banking secrecy was broken by the US Department of Justice which sued UBS (and subsequently other banks) for violating their Qualified Intermediary agreements. The results of these lawsuits were the justification for FATCA (and FATCA, in turn, was the justification for CRS). I will not defend tax evaders. These 106 Australian taxpayers deserve the full force of whatever enforcement action the ATO can bring to bear. However, the resulting tax revenue will be the result of old-fashioned investigation based on information provided by an informant. None of the very costly Automatic Exchange of Information (AEoI) schemes has had any impact in this case. Many government officials around the world believe that AEoI has generated BILLIONS of dollars in tax revenue from assets hidden in “offshore” accounts. Last week an official of the Chilean revenue office told me that she thought AEoI had generated $85 Billion of tax revenue world-wide. When you try to get to the bottom of these numbers, however, you find news stories like this one. Revenue that has been generated by data leaks and informants, not income that has been reported by FATCA (or CRS, which had its first data exchange last September). While I believe there are some who have (or will) “come clean” in fear of FATCA/CRS before they are identified by their local revenue authority, it is quite possible that the net revenue impact will be less than the considerable global compliance costs that AEoI has imposed on the financial services industry. For details on the costs and estimated revenue from FATCA, see section 1.02 of Prof. William Byrnes’ paper on Background and Current Status of FATCA and CRS. I have been looking to see whether compliance among US expats has increased post-FATCA. While the anecdotal evidence appears to be that many “minnows” have been scared into compliance by the fear-mongering of tax professionals, the effect is not yet apparent in the data. The IRS publishes data on returns filed with an overseas address – these include returns filed by active duty military stationed overseas as well as residents of Puerto Rico, US government employees stationed overseas, and expats. The number of returns in this category has declined sharply since 2009. 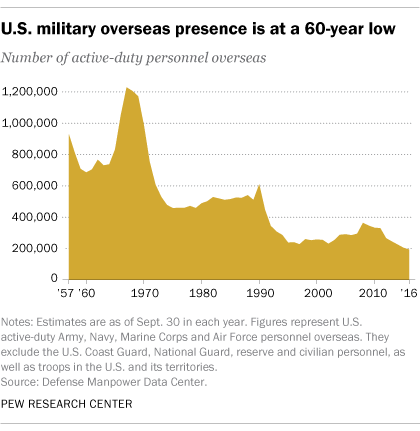 The number of returns appears to be highly correlated with the number of US military personnel stationed overseas, which is currently at the lowest level in decades. Once you remove military personnel, the compliance rate for other expats in 2015 appears to be between 15-20%, which is the same rate that has been quoted since before FATCA. The effectiveness of FATCA, and AEoI generally, in increasing compliance rates is still unclear. The cost of compliance in Australia alone was estimated at over A$200 million. It’s time someone did a comprehensive, rigorous cost-benefit analysis of these schemes. Karen, Very informative. The only thing is the number of people filing may have stayed the same, but how has the amount of tax collected been impacted? If the amount collected has increased, how much of that were penalties and fines, verses taxes owed? It is one thing to say that the IRS is collecting more or less, or more or less or the same number of people are filing. But to understand what they are collecting is another story. Good question, Greg. I’ll have to go back to the data and look. There is no evidence that FATCA is related to “tax evasion” one way or the other. But, I do think that the FATCA plays an interesting role for the U.S. Government. As the rich get richer and the poor get poorer, a higher percentage of the income of the wealthy comes from capital. Capital is mobile and can be moved around the world. For years the world has been operating on an “income taxation” model and not so much on a “taxation of capital” model. It is becoming very clear that the United States is moving toward a revenue raising system that is based on the taxation of capital and the confiscation of capital. Things like the “FBAR Fundraiser”, PFIC, CFC, U.S. Transition Tax, etc. are really methods of capital confiscation. Sure, it’s under the guise of penalties, fake income, etc. But, it’s about capital confiscation. FATCA is not effective in a system of identifying traditional income. But, FATCA is more effective to identify capital assets for future confiscation. FATCA was and used to identify the foreign corporations that hold passive assets. The passive assets are the proceeds of undistributed earnings. Note how the “transition tax” is going after undistributed earnings and therefore the capital assets. 1. Use FATCA to locate the capital assets. 2. Confiscate the assets once located.